Congrats to Rino’s Vancouver SC Tigers for winning the 2018 Richmond Regional Summer League Premier Divison! Ending with a 5-3-2 record and +15 Goal differential. 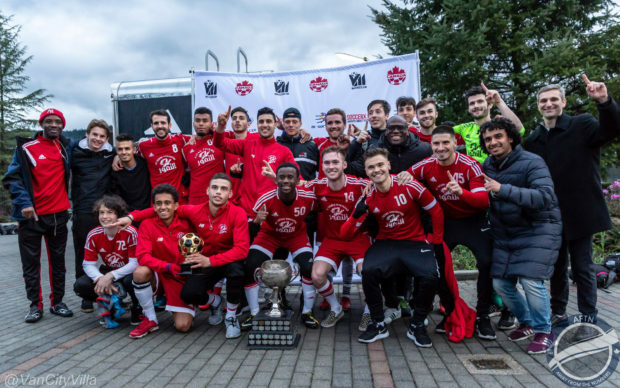 There’s a new name on the Vancouver Metro Soccer League (VMSL) Imperial Cup. 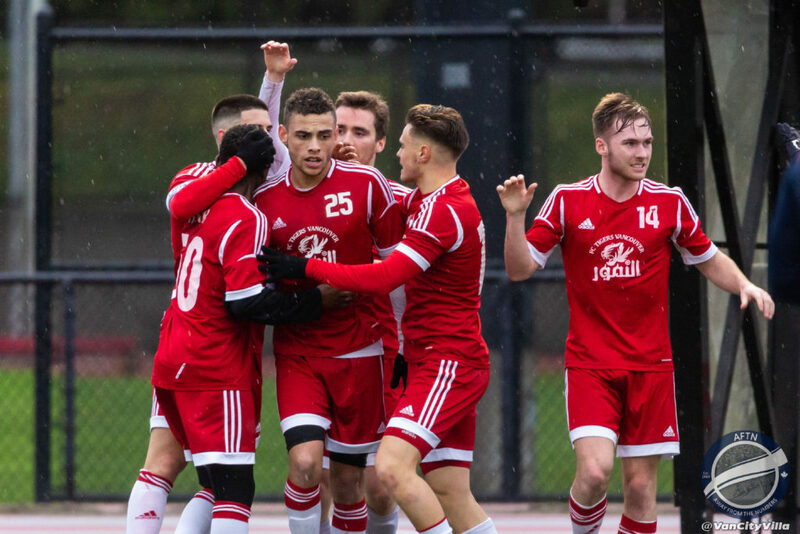 Rino’s Tigers lifted the famous 105-year-old trophy for the first time in their history following a 2-0 victory of Croatia SC at Coquitlam’s Percy Perry Stadium on Saturday afternoon. For a match between two high scoring teams, that had produced 13 goals in their two league meetings this season, the anticipated goalfest didn’t come, with both defences standing strong again some dangerous attackers. That said, both teams had chances to make this a far more high scoring game, but they were unable to bury them. Rino’s came out strong from the off and dominated the first half. The opening ten minutes were marked by some fierce tackles flying in from Croatia, and you started to worry that TSS Rovers may be missing some of their Rino’s players for the new PDL season the way things were shaping up, but things soon settled down and both teams concentrated on getting the first goal. Rino’s were looking the more dangerous, with Croatia find themselves caught offside several times from a high Tigers backline. The best of the early chances fell to Whitecaps Residency alumni Declan Rodriguez in the 20th minute, after a spell of concerted Rino’s pressure. Connor Glennon went on a nice run up the right, playing the ball back to Erik Edwardson at the top of the box. The Portland Pilot midfielder played a neat ball to Rodriguez in front of goal and his cheeky back heel from the edge of the six yard box was blocked by the legs of Croatia’s keeper, Ante Boskovic. Rino’s squandered another couple of good chances, with Rodriquez firing into the side netting and another Whitecaps Residency alumni, Daniel Sagno, blasting over, but Tigers weren’t to be denied and they finally got the go-ahead goal when Rodriguez finished at the near post from a tight angle in the 36th minute. Rino’s were well deserving of their one goal lead at the half, but Croatia came out to make a game of it in the second. The game became end to end, with both teams having a number of chances to grab the next goal. Tigers’ Matteo Polisi came close twice, with a free kick and then drilled a low one to Boskovic’s near post. Croatia responded with a Johnny Sulentic free kick of their own that just zipped over, before Sulentic just failed to connect an outstretched leg to a great ball to the back post. As Croatia pushed hard for the equaliser, they left themselves short at the back and Rino’s smelt blood. Edwardson fired over from a good position, before crashing one off the bar. Boskovic had to come up big to keep Croatia in the match, saving from Rodriguez at the near post and then turning a Glennon chance just past the post, when it looked certain he’d score in the 66th minute. Tigers thought they’d finally doubled their lead two minutes later when Matteo Polisi turned in a deflected Rodriguez cross, but he was deemed to have been in an offside position when the pass was made. Both teams had a couple of close calls, before Edwardson wrapped it up for Rino’s in the closing minutes, picking his spot to finish a Glennon pass after a quick breakaway. And that was that. Rino’s Tigers were the 2018 Imperial Cup champions. You can see our highlights video from the match, as well as the trophy presentation, below. After achieving promotion back to the VMSL Premier from Division 1 last season, it’s been a great year back in the top flight for Rino’s and a great achievement for the players and personally for head coach Blaise Nkufo.